Many people in the village are involved in practical ways to keep St Mary’s the fantastic place it is. There is a small army of people who regularly mow the churchyard and keep it tidy and looking pretty. Others like to support us through the activities organised by Harkstead Heritage. For special services around Christmas, Easter and Harvest, the church is always decorated in a sea of flowers. If you would like to help, please contact Jenny Freeman on 328381. 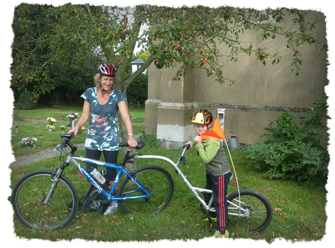 Every year on the second Saturday in September a number of people support us raising funds by taking part in the Historic Churches Trust sponsored Bike Ride. Others help out by being in church signing the papers of those cycling from church to church. Even one of our youngest members does his bit by getting on his bike. Thank you to all those who sponsored our cyclists last September. The people of St Mary’s want to be there for you whenever you need us. We do not receive any regular funding from outside agencies: everything we do is funded through the generous giving of our church family members and people in our local community. * By setting up a Standing Order with your bank – if you would like details on how to do this and on church bank account numbers, or a Standing Order form then please contact our treasurer Mr Patrick Shone through our contact page.